The Red Sox have exercised their $15 million option for next season on ace left-hander Chris Sale. Sale will earn $15 million in the final season of a five-year contract he signed with the Chicago White Sox before the 2013 season that guaranteed $32.5 million, including a 2017 option buyout. He had a $12.5 million salary this season in the first of two option years and will wind up earning $59 million over seven seasons plus award bonuses. In addition, infielder Eduardo Nunez exercised his $5 million player option rather than become a free agent. 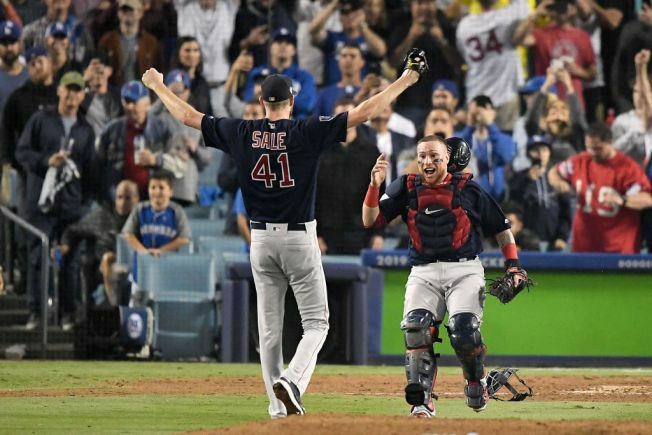 The 2017 AL Cy Young Award runner-up and a seven-time All-Star, Sale struck out the side in the ninth inning of World Series Game 5 against the Los Angeles Dodgers to close out Boston's fourth championship in 15 seasons. Boston announced its decision Tuesday, two days after the finale. The 29-year-old earned his first playoff victory in Game 1 of the AL Division Series against the New York Yankees. Sale went 12-4 with a 2.11 ERA and 237 strikeouts in 27 regular-season starts in his second season in Boston. He was among the favorites to win the Cy Young this season before shoulder issues during the season's second half. Nunez hit .265 with 10 homers and 44 RBIs in 502 plate appearances, playing second base and third.